Come explore a world of recreational possibilities by day  sleep like a baby cradled in sweet silence all night. 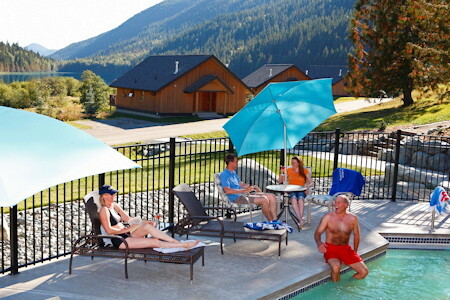 Located just 25 minutes east of Clearwater, British Columbia, and central to six provincial parks, Alpine Meadows Resort is one of the North Thompsons finest getaway destinations. From spring through fall, its the preferred choice for those looking for authentic BC-style outdoor adventure, while still enjoying all the upscale comforts of home. Drive through the impressive stone gateway and you enter a fun and intimate resort. 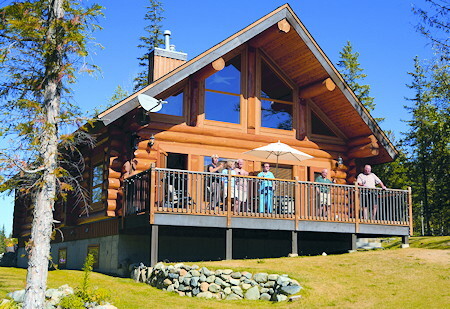 Youll see contemporary log cabins all with sweeping views of Lake Hallamore, lush forests and snow-capped mountains. Youll see guests suntanning on their lakeview decks, fishing from boats, lounging around the outdoor jacuzzi or enjoying a chef-inspired meal on the lakeside patio. You may spot wildlife in and around the resort, kids on their bikes and families and friends on their hikes. Offering the finest accommodation north of Kamloops, our guests enjoy the kind of comfort and convenience exclusive to first-class lodgings. The Resort offers 29 contemporary, lakeview log cabins in varying configurations: one-bedroom suites and alpine chalets, two-bedroom family log homes and three-bedroom executive log homes. There is even a honeymoon/couples retreat suite. Pets are welcome too. The hilltop RV-Park provides a large asphalt pad and access to all of the resort amenities and services. A gated entrance provides security and there are hook-ups for water, sewer and power, along with washrooms, showers and laundry facilities. 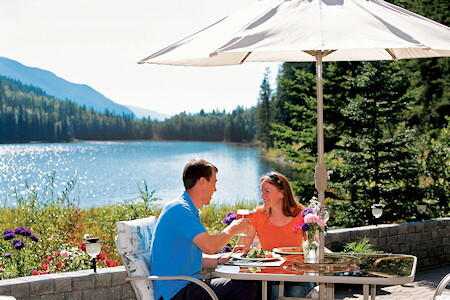 Lakeside is The Boat House Restaurant + Patio serving breakfast, lunch and dinner. The food is prepared by our very own Chef so its fresh and fabulous. The Barbecue Centre is a popular dining option when the Chef fires up the huge barbecue for all our guests. Central to six provincial parks, adventures and activities abound for all: hiking, fishing, golfing, canoeing, kayaking, river rafting, non-motorized boating, swimming, wildlife viewing, mountain biking, guided horseback riding, guided eco-tours and excursions to Wells Gray Provincial Park. 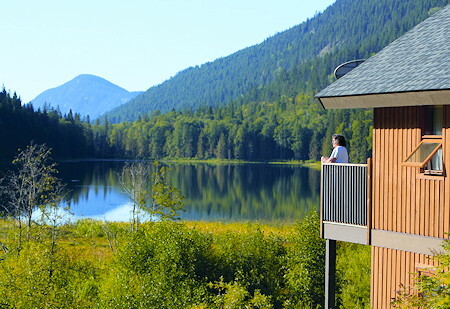 On-site guests enjoy relaxing in the large lakeview jacuzzi, paddling around Hallamore Lake or hanging out at the indoor/outdoor Activity Centre.